The Prince of Cambridge was born more than a week ago, and he is still big news around the globe. As future kings are born only once in a generation or so, this makes Prince George the most famous baby in the world, and it seems like an opportune time to take a look at his names. George is derived from the Greek name Georgios, translated as “farmer”. Because it literally means “worker of the earth”, it specifically refers to the cultivation of crops. The name George became known throughout Europe because of Saint George. According to tradition, he was a 3rd century Roman soldier from a noble Christian Greek family in Palestine. His military career went swimmingly until he was asked to sacrifice to the Roman gods, and when he refused, he was tortured and beheaded. He is venerated by Christians as a martyr. Much later, the legend of Saint George saving a princess from a dragon was tacked on to the story. This medieval legend came from the Eastern church, and seems to be an attempt to Christianise pagan myths such as Perseus. It was brought to Europe by the Crusaders, and became a medieval romance. Saint George is the patron saint of England, and his flag, a red cross on a white background, forms part of the Union Jack. Despite Saint George being the patron of England, his name did not become particularly common there until George I, who was German-born, took the throne of Great Britain in 1714. The name became a traditional one in the royal family, and there have been six British kings named George; the most recent the father of the present queen; he was born Albert Frederick Arthur George, and reigned under his last middle name. George is a common name amongst many of the royal houses of Europe, and Prince Philip’s grandfather was George I of Greece, with Prince Charles having George as his last middle name. There has only been one other Prince of Cambridge, and the first one was also named George. The name George is a sturdy classic in Australia which has never left the Top 100. It was at its peak in the 1900s and 1910s at #4, and has never been lower than #72, which it reached in the early 2000s. Currently it is #71 nationally, #64 in New South Wales,#69 in Victoria, #79 in Queensland, #48 in Tasmania and #50 in the Australian Capital Territory. Alexander is the Romanised form of the Greek name Alexandros, translated as “defender of men, protector of men”. It first turns up in Greek mythology as the epithet of Paris, prince of Troy, who gained it while only a child, rescuing cattle from thieves while working as a cow-herd. There was a slightly earlier real life ruler of Troy named Alexander, and it’s possible the fictional Paris ended up with his name. Just as George is a traditional name in the British royal family, Alexander was traditional in the Macedonian royal family, and the man who made the name famous for all time was Alexander III of Macedon, otherwise known as Alexander the Great. A young man of boundless ambition, Alexander conquered much of the known world, including Persia and Egypt, and invaded India before being turned back by his own men, who were getting pretty sick of his let’s-conquer-the-whole-world attitude. Alexander was a history-maker, a great commander who never lost a battle, a role model for the empire-building Romans, and whose military strategy is still used today. He was a figure of romance, with legends being written about him even in his own lifetime. And he took power while still a teenager, dying in his early thirties, so he is always remembered as youthful, vaunting and energetic. The name Alexander, and its many variants, spread throughout the world. There are early Christians named Alexander mentioned in the New Testament, several saints named Alexander, and many popes. Alexander I of Scotland was named after Pope Alexander II, who gave his blessing for the Norman Conquest, and there were two more Alexanders after him in the Scottish royal family. There has never been an English king named Alexander, but the name isn’t uncommon in the royal family, and it’s especially seen use as a middle name. In Australia, Alexander is another sturdy classic which has never left the Top 100. It was #29 in the 1900s, and sunk to its lowest level in the 1950s and ’60s at #89. It is currently enjoying some of its highest levels of popularity, being #16 nationally, #14 in New South Wales, #9 in Victoria, #20 in Queensland, #21 in South Australia, #21 in Western Australia, #26 in Tasmania and #17 in the Australian Capital Territory. Louis is the French form of the old Germanic name Chlodowech, Latinised as Clovis, and whose modern German form is Ludwig. It means “famous warrior”. The 5th century Clovis I was the first king of the Franks to unite all the Frankish tribes under one ruler, so that they were now ruled by a single king, with kingship descending onto his heirs. He was also the first Christian ruler of Gaul. Having created the Frankish monarchy, it’s little wonder that his name was such a big hit with French rulers, with 19 kings of France bearing the name Louis (the last one only managed a few minutes before he abdicated). The first one was Louis the Pious, son of Charlemagne, who was not only king of France but also co-ruler of the Holy Roman Empire – Louis was a traditional name amongst the Emperors as well. Louis IX, or Saint Louis, is the only French monarch to be canonised, and Louis XIV was known as Louis the Great, or the Sun King, one of the most powerful monarchs to ever rule France. It all went wrong for Louis XVI, who was executed during the French Revolution. The other Louis the Somethings were kings in name only, as the throne had been abolished and France was no longer a monarchy. Although so strongly associated with the French crown, Louis has been well-used as a middle name in the British royal family – in fact George I’s full name was Georg Ludwig, or George Louis. Louis is the final middle name of Prince Edward, who may have gained it from one of his godfathers, Louis, Prince of Hesse and Rhine, and Prince William, who is said to bear it in honour of Louis, Lord Mountbatten, a mentor to Prince Charles. Louis has several pronunciations, for in French it is said loo-EE, and in English it can either be pronounced LOO-ee or LOO-is. The royal family use the LOO-ee pronunciation. Somebody recently wrote into the blog, worrying that if she called her son Louis, people might say it LOO-is by mistake, which doesn’t seem unlikely. The name Louis is an underused classic in Australia which has never left the charts, yet never become popular. It was #101 for the 1900s, and reached its lowest point in the 1970s at #290. Since then it has continued climbing, and is currently #113 and still going strong. 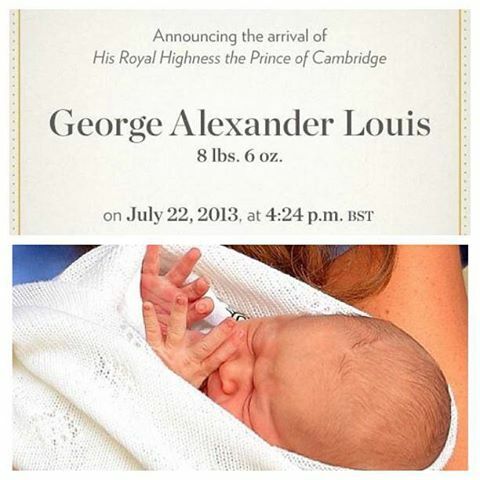 George, Alexander and Louis are excellent names for a king-to-be, and great names for any boy. All classics, these are names which have stood the test of time, and been borne by men who were not just part of history, but changed history. They are names of kings and warriors and saints, defenders of the realm, and those who sought new worlds to conquer. Yet they have been borne by so many ordinary people as well that no particular expectations come with them. These are names perfect for a prince – are any of them perfect for your little prince? POLL RESULTS: George received an approval rating of 66% , Alexander of 88%, and Louis of 69%.